Yurt Holiday Spain. Unique Glamping in Spain Costa Del Sol. Andalucian Retreat. 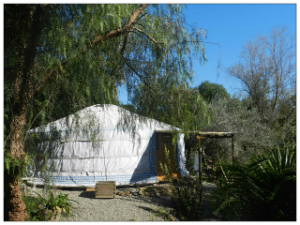 Our Yurt is ideal for your Spanish mini break or week long holiday in the Andalusian countryside of Malaga. The Costa Del Sol offers more than a traditional beach holiday and here in Coín just 20 minutes inland of Marbella with our hand-crafted Yurt, idyllic location and stunning views, there’s no better place to relax and enjoy your Spanish holiday. Self-catering (evening meals can be provided by request) where you can relax and enjoy exclusive use of your very own beautiful swimming pool in quiet surroundings. You will find Finca Azahar nestled in the Valle De Azahar (Valley of Blossom) surrounded by orange and lemon groves with stunning views of the surrounding mountains. The pretty village of Coín is only 4km in the distance with its numerous restaurants and bars of a typical white village while Malaga airport is only 15k away. We are located between two rivers, one being the Rio Grande which is one of the largest and well known rivers in the area with many species of birds and wildlife within a 10 minute walk. The Finca is a small holding set in four acres of picturesque land made up of olive, orange and lemon groves and many other varieties of fruit trees. It also has small private gardens with an array of native Mediterranean flowering shrubs and plants of which one incorporates a lovely swimming pool area. Take in the mountain views while relaxing or sunning yourself by your private pool or retreat to one of the many secret areas on the Finca under leafy trees for those lazy afternoons or even go and sit with our lovely horses whilst they graze peacefully down by the river. We have lived here now for thirty years and live on a separate area of the Finca and can help with any advice you may need regarding walks, places to visit and any general knowledge of the area. We are enthusiastic gardeners and lovers of nature, the quiet life, growing all our own vegetables and herbs in the greenhouse and raised beds set in amongst the orange trees. We have chickens for free range eggs, two friendly dogs and a cat.